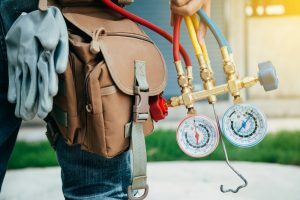 Installation and servicing your ducted heating system are two important components of running and maintaining your air conditioner’s performance. Whether it's a cracked duct or a dirty filter, Thomas Air will perform a full service to ensure you stay warm and safe this winter. Gas Ducted Heating, also referred to as central heating or gas heating system, is a ducted heating system that is situated either in your roof or under your floor. Outlets are strategically placed throughout your home, either in the floor or ceiling. The position of the heating unit depends on your house and the availability of space. As the name suggests, it uses gas to produce heat which is then distributed through your home. A ducted gas heating system is operated by passing cold air over a heat exchanger; the air is then warmed through gas combustion & distributed and pushed throughout the home via a series of ducts, with connecting vents in either the ceiling or floor. The air drawn is directed into an air grille, which when flows into the central heating unit. The air is warmed before being distributed to each room via a network of ductwork connected to outlets. The result is warm gentle air from your gas heating system! Once your home reaches your desired temperature, the heater unit switches off. We do both installations and regular heating services of ducted heating systems. Regular services are advised to ensure the life-span and efficiency of your ducted heating system is at its best. We check fuel leaks and pump pressure to make sure your ducted heating system isn't costing you a fortune in electricity bills. Under performing heating systems can put massive costs not only on yourself, but also on the environment. We follow all industry codes of practice and our fully-qualified and friendly technicians are reliable and experienced, making us Melbourne's leading ducted heating and service maintenance team. We pride ourselves on delivering excellence in workmanship and customer service to ensure your heating needs are handled by professionals. Check fuel system for fuel leaks, etc. For your gas ducted heating quote, contact Thomas Air today. At Thomas Air, we pride ourselves on our customer service and ensuring that we get the job done at an affordable rate. So give us a call on (03) 9553993 or leave us a message to get a free quote as soon as possible - do not leave yourself out in the cold this Melbourne winter!